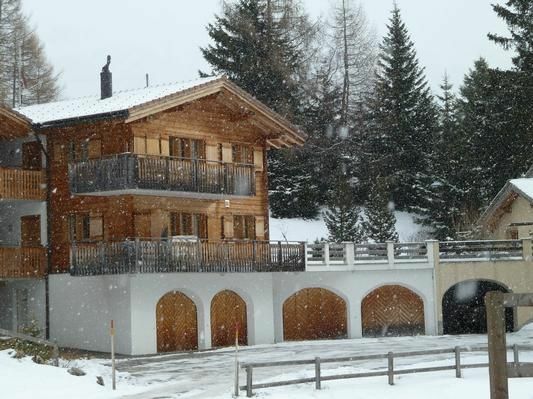 Le Chalet is situated on a sunny terrace above Lenzerheide. The cosy hamlet is been kept, like in the old times. The house is oriented south. It has a garage on the ground floor and above there are 2 floors with terraces and garden. -On the first floor, you find the kitchen and a big wooden tabel equipped for about 8 persons, with a cheminé in the back. 2 doubel bedrooms and a big bathroom. -On the upper floor, there is a other bathroom with a sauna. A big living room with a office corner. One more bedroom. The balcony opens here from the living room. We have a lot of designer furniture, and hope, you will like it, as we do. Final cleaning: once per object Costs amounting to 180 CHF (Mandatory). Fuel for chimney/fireplace: per object and day to be brought by tenant (Mandatory). Cot for children: per object and week for rent at a price of 35.48 EUR (Mandatory). Visitor's tax: per person and day Costs amounting to 2.57 EUR (Mandatory). Bed linen: per person and week for rent at a price of 30 CHF (optional). Pet: per pet and week Costs amounting to 70.97 EUR (Mandatory).